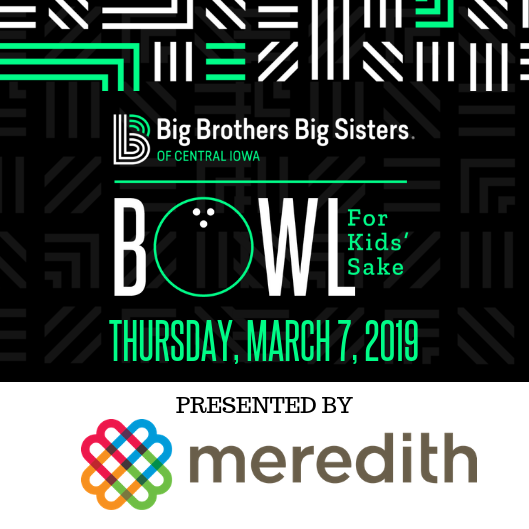 Bowl For Kids’ Sake, presented by Meredith Corporation, is on Thursday, March 7, 2019! Join Big Brothers Big Sisters of Central Iowa for its signature fundraiser, Bowl For Kids’ Sake, at bowling centers throughout Des Moines. Bowl For Kids’ Sake is about having fun to help kids. Funds raised go directly toward matching children with carefully-screened, caring Big Brother and Big Sister volunteers. How does Bowl For Kids’ Sake work? 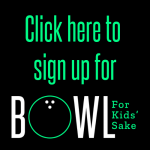 First, form your team (up to five people) and sign up on the Bowl For Kids’ Sake website. 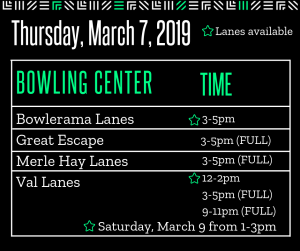 You will be prompted to select a time to bowl- check out the bowling center and time options below. Once you’ve signed up, raise $125 per person to get your two games of bowling, shoe rental and a BBBSCI t-shirt. Raise money to support life-changing, mentoring relationships in central Iowa! Thank you to our amazing sponsors- click here to view a list of sponsors. If you have questions or to request sponsorship information, please contact Amy Hall, Events & Volunteer Management Coordinator, at ahall@bbbsia.org or 515.288.9025 x235.